Tigridia pavonia is commonly called the Jockey’s Cap Lily. From Mexico these colourful flowering bulbs have flowers that last for a day. However they do flower continuously over a long period so provide good colour for weeks on end. Also known as the Peacock flower, or Mexican Shell flower, the blooms are colourful with reds, yellows and white varieties available. Each bulb will send up multiple stems topped with the colourful flowers. The flowers appear sequentially to flowering period is extended. The name Tigridia, means Tiger like and refers to the colour of the central petals of the flower, red and yellow. 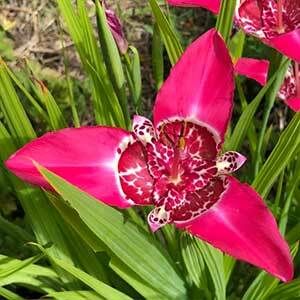 These are a a tall growing plant and can be planted at around 10 cm apart and at 10 cm deep as well. Best planted in clumps to improve the flower show, although they can be spread through a mixed border with good effect. The bulbs are best planted in winter to early spring, good sun and good drainage is essential. Propagation is easy by division of established clumps and also possible from seed. Flowers – Large yellow, white or red flowers with speckled petals in the centre. 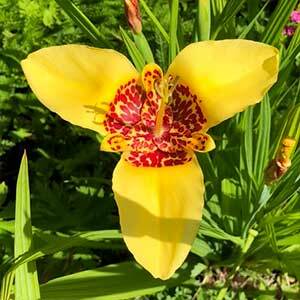 The Jockey’s Cap Lily is available for sale from the following nurseries.